With an aim to fulfill varied requirements of our valued clients, we are engaged in offering Polyester Sling. 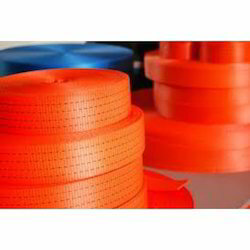 We manufacture a variety of superior quality polyester webbing. Our polyester webbing are made with the objective of providing strength, extra protection and safety to the passengers. The belts can be customized in terms of width, designs, patterns and weaving to enable use in other industries. 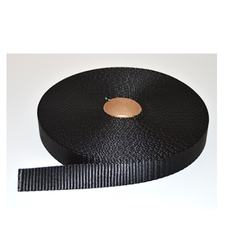 We are engaged in offering a wide range of Webbing L that is in line with the industry standards. These webbing are used in varioue industries and products. The webbing are available in various widths, colors, length and designs that can be custom made as per requirements of the clients. Polyester webbings made from high tenacity yarn load bearing from 1 tonne to 15 tonnes . With the help of our efficient workforce, we are capable of providing our clients with a comprehensive range of Polyester Webbing that is lighter in weight, less expensive and easier to sew as compare nylon webbing. Our range is widely used in handbags, backpacks and dog leashes. Available at industry leading prices, our range comes in several colors, sizes and designs. We supply high quality polyester webbing slings, flat web slings, ratchet lashings, ratchet endless slings, multi-leg slings, bag slings, anti abrasive sleeves, tow straps and metal fittings. These are 100% high tenacity polyester, multi filament yarn having excellent light fastness and heat stabilization. nylon webbing niwar for manufacturing dog collars, dog leashes, pet collar leashes, dog belt collar, nylon dog leash , heavy dog leash royal. colours: royal blue, golden, black, red, mahroon, purple etc. We are engaged in manufacturing a wide range of Polyester Niwar. Our professionals make use of latest technology in the manufacturing of these tapes. Moreover, we also offer web and belts to our clients which find their wide applications in many diverse areas. Available Color: Red, Black, Green, White, Yellow etc. We offer Synthetic Slings in all Capacities & Configurations. Slings, Twin Path Slings & Heavy Duty Accessiries & Fittings. Keeping in mind the precise demands of clients, we offer a wide range of Duplex Polyester Webbing Sling.